The Millionaire Fastlane Review - Still In The Sidewalk? 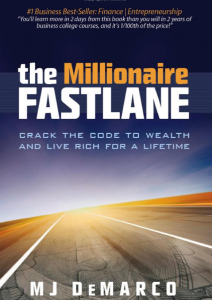 The Millionaire Fastlane is a book that aims to make a point similar to books like the 4-Hour Workweek and the rest of the genre. The conventional path of life is no longer viable, nor is it desirable in and of itself. Should we all get a good education, work our asses off, save money and wait for retirement to enjoy the fruits of our labor? MJ DeMarco believes there’s another way. 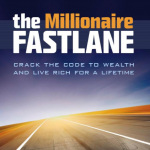 In today’s review of the Millionaire Fastlane, I aim to showcase the best gems you can get from the book. Let’s dive right in. Main Point: The Millionaire Fastlane suggests that with the right mindset and a new way to think about wealth, you can end up rich and young. No need to become grey-haired in order to ride your Lamborghini, live in your dream house and have the freedom to do everything you ever wanted. You can do all while young and free. How do you believe people become wealthy? Is it through luck or a rich family? Maybe a degree from a prestigious University? Or having good connections? Well, if you thought something from the above you are dead wrong! According to DeMarco, the right mindset is what actually makes people truly wealthy. He believes that your fate is inside your control and is actually heavily influenced by the way you think about things. Luck is only created by a good process. People never realize this, because they are not privy to the process that happened before luck showed itself. DeMarco suggests planning ahead in life. People who plan ahead successfully will actually not be impacted by events like an economic recession or any of life’s challenges. That’s why it’s detrimental to be living paycheck to paycheck. People that live this way can be disastrously affected by the loss of a job. Don’t feel entitled to wealth because of some prerequisites you think you have. The only way to become wealthy is by working hard and not quitting. Nothing more, nothing less. Hard work, discipline, and delayed gratification. DeMarco states that being wealthy isn’t about money and luxury. He defines wealth as the mix of the 3 fs. Fitness, Family, and Freedom. Being healthy, being surrounded by beautiful people and having the freedom to do whatever you choose to do with your life. Faux wealth, on the other hand, is the illusion of wealth. Having fancy stuff that ultimately takes away your freedom and makes you even more dependent. He proposes that if you are asking yourself if you can afford something, then you can’t. You never wonder if you can afford a candy bar. That’s why you can actually afford it. A high income doesn’t mean anything. The most important step is assuming responsibility for our lives. We shouldn’t rely on others nor blame other people or circumstances for our success or lack thereof. And that is actually the reason people spend money on instant gratification. They believe they have no control over their money so they end up spending while they still have it. And that’s the very reason bank accounts and high incomes are spent so easily. Why do you think many lottery winners end up broke? Why do you think celebrities end up with huge debts? They don’t have the right mindset towards wealth, despite their extremely high incomes. As a result, they return to the status quo of their own mindset. The reality of poverty. They dig their own financial holes and do so without ever realizing it. That’s not to say that you shouldn’t enjoy life now. However, realize that the possibility of you dying tomorrow is pretty low. And even with possible disasters coming your way, planning ahead will make a huge difference for the better. First of all, what if the conventional plan of life won’t even get you to the life you want? After all, there’s a limit to how much someone can earn from a salary alone. The number of hours you can work, as well as the raises you can get have a ceiling, unfortunately. Not to mention stock markets and similar investments. You have no control over the stock market and many people have actually lost a lot of money with the recent economic crisis. To top it all off, have you ever thought about inflation? Do you know that the value of the money you have invested years from now will be less? Can you really rely on these income sources at the end of the day? Furthermore, how many people have invested in pensions only to find themselves getting them cut and never getting the money they invested in? I live in Greece and in today’s economic crisis this is an unfortunate everyday reality. More and more people are getting their pensions cut, pensions they have paid for over and over during their best working years. From money they could have spent elsewhere. The moral of the story is, if we are not getting wealthy then we should stop doing whatever we’re doing and do something else instead. Even if you get rich through the Get Rich Slowly Path, will you be young enough or healthy enough to enjoy it? We tend to focus on events like selling a company or getting a job that supposedly get us rich. However, the case actually is that processes and the hard work that they entail get us rich and ultimately bring those events into our lives. Besides lottery winners, we don’t get rich by events, but by processes. Don’t skip the process, because this way you won’t get the events. DeMarco describes 3 roads to wealth. The Sidewalk, where people live for the moment only, at the expense of future financial security. Its destination is poverty. The Slowlane, which is the opposite of the Sidewalk, where people live for the future sacrificing today. Its destination is mediocrity. Finally, the Fastlane where you work hard on something that people value, in order to become wealthy in the next 5-10 years. The Sidewalkers view debt as an asset that gives them the ability to enjoy a pleasant life right now. They have fallen into the trap of instant gratification and blame external factors for their current situation. Events like a job loss, a change in the stock market or a recession are detrimental for the sidewalkers. Note that there are sidewalkers with high incomes that end up poor because of their faulty mindset. The Slowlaners, on the other hand, sell their weekdays for the weekends. They budget aggressively, look for deals and coupons and rely on compound interest to become rich. Those strategies aren’t bad in and of themselves. The problem is having those strategies as your entire plan. Robert Forst has said that you can work faithfully 8 hours per day, so you can become a boss and work 12 hours per day. The problem with jobs is that you have limited leverage and limited control over your income. There is a limit to how many hours you can work and on top of that, other people (like your boss) decide on your income and if you’re gonna have a job next month or not. Another big problem is relying on compound interest. It’s nice to have millions in forty years. However, compound interest returns most of that money towards the end of those years. Will you be alive by then? Will inflation be the same? Is it worth it to not have the extra money you invested year after year? The Slowlane can make you rich only at the end of your life. The youthful rich don’t utilize mutual funds and 401(k)s to get rich. Slowlaners also believe in education to raise your value as an employee and thus your hourly rate. And that is partly true. However, there are factors such as student debt and the productive years you lose in education that aren’t considered. Not to mention the fact that many people study occupations they hate just because they crave a fake job security. DeMarco warns you to beware of financial gurus. Those people rarely get rich with the methods they teach. Rather, they become rich by… teaching. He urges you not to spend your money on expensive seminars that only make the gurus rich. That is also true in internet marketing. You should choose teachers that have actually done what you want to do. For example, I have chosen the Wealthy Affiliate platform as my go-to affiliate marketing resource, because the owners and a lot of members alike are seasoned affiliate marketers themselves and actually teach what’s working for them in reality. The way to get wealthy according to DeMarco is to dramatically grow your income while controlling your expenses. The Fastlaners have a distinct set of characteristics that define them. They get rich in 10 years or less. They can live luxury lifestyles. They can control their own assets. They use investments to stay rich, not get rich. They control their income streams and they use their houses for residency and not for their net worth. Fastlaners have Controllable Unlimited Leverage. They have control over their income and the ability to scale it to their liking. Debt for the fastlaners is a tool to grow their systems. Time is their most important asset. Their vehicle for wealth accumulation is building something of value. That way they can get rich in 5-10 years, with a lot of hard work and finally have the ability to live life with no restrictions and complete freedom. Fastlaners don’t just view themselves as responsible for their success or lack thereof. They view themselves as accountable. That means having the accountability to change your actions in order to reach success. Accountability is far stronger than responsibility alone. Fastlaners create systems that build them wealth. This doesn’t mean avoiding work. It just means having the resourcefulness to think upfront of a system, build it, optimize it and automate it as much as possible. Fastlaners don’t consume. They are the guys that produce. They may produce a book, an invention or piece of technology, a business or whatever. Also, Fastlaners don’t buy assets that lose value such as cars. They buy assets with potential value, such as patents and businesses. The leverage that the Fastlaners have is the many variables they can control. It’s not just the hours they put in anymore. It’s the advertising, the pricing, the conversion rates and many more, that give them the ability to skyrocket their results with simple but intelligent tweaks. They hold the power of entrepreneurship. When building income systems, be sure to think of your profit potential beforehand. How big is your target market? (And here lies the power of the internet and making money online). Also, how much value can you add to your customer’s life? The more you can affect people’s lives, the more money you can make. On top of that, industries have multiples that give you the value of your company. Multiply that by how much money your business makes each month and you’ll get how much your business worths. Different industries, such as technology, patents, and medical appliances have higher multiples that give you more leverage for profit. Money trees are an excellent road to wealth. They are business systems that live and grow on their own. Good examples are rentals, software, content and distribution systems that others can use to make money. The Wealthy Affiliate platform is actually a perfect example of a distribution system. And the best money tree is money itself. However, the Fastlaners start with a lot of money and then use the power of lending or compound interest to create other sources of income. A choice made early enough will make a huge difference in the course of your journey. You can choose two things: what to think and what to do. If you aim to become wealthy start by changing your thoughts and believing you can actually do it. And if it’s difficult to change your beliefs, look for evidence. Search for people who have done what you want to do. For extraordinary results, start to think extraordinary. Ignore people who discourage and doubt your goals and dreams. Find and be around people that empower you. Find a life partner that does the same and helps you become the best version of yourself. When you are making choices learn to ask yourself what’s the worst that can happen. In most cases, the worst case scenario is not as bad as you thought and you can actually get back to a normal state pretty easily. This is similar advice to what Tim Ferriss suggests in the 4-Hour Workweek. Another technique DeMarco suggests is a weighted average decision matrix. When thinking of a choice, state the factors that are important to you and give each of them a weight of importance. Rate the factors, multiply them by their weights and sum them. Then finally go with the choice that gets the highest final rate. Realise that time is finite and ever decreasing. Never waste it and never exchange it for mere pennies. Fastlaners are frugal with their time. View time as indentured (things you have to do) and free time. Money buys free time and eliminates indentured time. View debt as parasitic as it forces you to work more. Always ask if the purchase you are about to make is worth the time investment required. Learn to avoid the trap of instant gratification and you’ll get much better results in terms of debt. Fastlaners also focus on learning new skills that can open doors to them. They don’t focus on formal education but rather on doing things in the real world. DeMarco suggests making time for learning by multitasking. He also urges you to focus on areas of your life that need improvement or areas that interest you. It’s important though to make the distinction between commitment and interest. True commitment is tearing down the walls that keep you from achieving your goals. A quote I loved is that failure is the sweat of success. You need to fail in order to succeed in anything. Just get back on your feet after failing and focus on the new direction the failure got you to. You should learn to take smart risks. Risks that have a big upside potential and a small downside potential. Avoid someday like the plague. Someday never comes. Learn to follow through on your plans sooner rather than later. The Commandment of Need states that in order to be successful in business you need to solve some problem or pain point and provide value to the world. Don’t just focus on your passion. Focus on being passionate about solving the pain point. The Commandment of Entry warns you that the easier someone can enter your business than the less potential there is for you to succeed. Regarding internet marketing, the barrier to enter is really low. You can even start learning with a free account on Wealthy Affiliate. However, few people stay in it for the long haul and do the hard work necessary to succeed and provide value to their audience. The Commandment of Control urges you to be in control of your business. Don’t rely on systems of other businesses but aim to provide those systems yourself. Never let anyone flip a switch and end your business. The Commandment of Scale suggests entering a business you can scale. A business where you could serve 10 people or a million people the same with the proper adjustments. If you can’t do that, then consider entering another business. The Commandment of Time asks if you can remove yourself from your business’s equation. Is there the potential to hire other people to do the work for you? Is there potential for automation? Moreover, never treat a business like a hobby. Be truly committed to what you’re doing from the very beginning. DeMarco goes on to propose 3 possible business models that follow the 5 Commandments. Those are the Internet (for example affiliate marketing), Innovation (inventing or improving products/services) and Iteration (buying something that violates the law of scaling, such as a franchise and use your profits to buy more down the road). Learn to look for business opportunities everywhere. When someone complains or has a problem, that’s a potential opportunity for you. Also, learn not to fear competition. Aim to become better than them. Regarding innovation don’t focus on huge improvements. There is huge potential in making existing ideas better. Money is freedom to do what you want. DeMarco here gives a 4-step process to achieve the desired freedom. As a first step state exactly what you want. At step 2 figure out the monthly cost of what you want. Add your living costs and be sure to multiply by 1.65 for tax purposes. At step 3 your targets should be chosen. Aim for a net worth 20 times your yearly requirement. Expect a 5% ROI from your assets. Also, aim for your money system/business to make 5 times your monthly requirements, so that 40% goes to taxes, 40% to your money system and 20% to your lifestyle. At step 4 you make your goal a reality. Keep your target monthly income in mind but focus on small goals along the way. First, start making 500 dollars per month and then aim for 5000. Also, never live beyond your means. This is an extremely similar process to the dreamlining Ferriss suggests in the 4-Hour Workweek. DeMarco goes on with a section on how to deal with customers’ complaints. Useful suggestions with the most important being that you can’t please everyone all the time. That’s actually a recipe for failure. He stresses the importance of having outstanding customer service that advertises your brand without paying for anything. It is also suggested not to approach business from only one angle but strive to find the many angles from which you can approach the improvement of your service. Have a perfect accountant and a perfect lawyer. Lastly, build a brand that people love/trust/admire, don’t just build some business. DeMarco gives some steps to follow for brand-building. First, have a Unique Selling Proposition (the classic USP). Outline your benefit and be clear and concise. Be unconventional, polarize people, interact with them and play with their emotions. Don’t have a cheap price because you don’t want your service to show off as cheap. At the end of the day realize that scattered focus leads to scattered results. Focus on one project at a time in order to see success. This rings so true for me, with the many interests I have and goals I try to pursue at each one time. A huge lesson that the One Thing Book gave me. Lastly, be sure to check the excellent forum of the book here. Can’t wait for your thoughts on the Millionaire Fastlane and the philosophy behind it. Be sure to leave your comments below. If you liked our review of the Millionaire Fastlane I would be forever grateful if you liked it and shared it using the buttons below. I really like the layout of your website!! It’s a great idea to have book reviews as well, I was thinking of the same thing but I thought it may be too broad and move away from the affiliate reviews? How are you finding your growth on this website and how long have you been using WA for? Also, I really like the layout of your ratings at the top, how do you do this? Sorry for bombarding you with questions, I really enjoyed your blog!